Couldn't wait for Spring to make this one! Bring on the warmer weather! 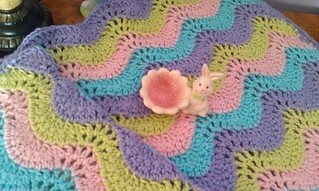 Rows of ripple crochet in heavenly pastel colors help create a wonderful Spring-time crochet blanket, perfect for Easter! 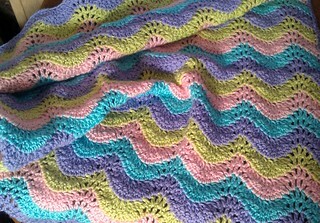 A combination of Caron Simply Soft and Bernat Satin yarns were used to design this crochet baby blanket pattern. 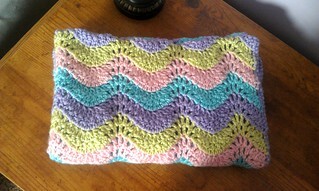 When I first started this blanket, I decided not to add anything contrasting such as an off-white or cream because the colors I chose alone just said EASTER to me! I worked on it every day for four days because I couldn't wait to see it finished! 3.5oz each of Purple, Blue, Green, and Pink. My blue and green were pastel colors while my pink and purple were just light. Finished Size: 30" x 34"
Row 2: ch 3 (counts as dc), dc in next dc (not in the space immediately below the ch 3), (dc2tog)x2, ch 1, dc in next dc, ch 1, (dc in next ch1sp, ch 1, dc in next dc, ch 1)x2, *(dc2tog)x6, ch 1, dc in next dc, ch 1, (dc in next ch1sp, ch 1, dc in next dc, ch 1)x2. Repeat from * to last two ch1sp. (dc2tog)x3, leave turning ch unworked. Row 3: ch 3, dc in next dc, (dc2tog)x2, ch 1, dc in next dc, ch 1, (dc in next ch1sp, ch 1, dc in next dc, ch 1)x2, *(dc2tog)x6, ch 1, dc in next dc, ch 1, (dc in next ch1sp, ch 1, dc in next dc, ch 1)x2. Repeat from * to last two ch1sp. (dc2tog)x3, leave turning ch unworked. 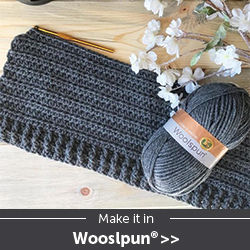 Repeat row 3 until desired length! 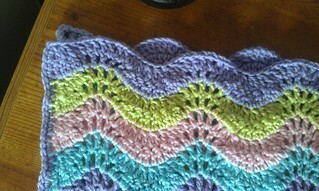 For the border, I loved having the ripple top and bottom so I just added a single crochet border to the sides to complete it. I think that's her green. Having trouble getting started. 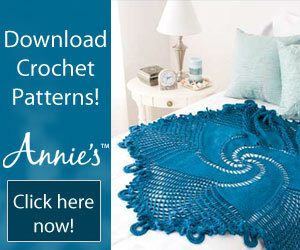 Pattern doesn't work out evenly starting with 121 chains. Foundation Row: Why isn't there a ch 1 after every group of five dc2tog, A ch1 is inserted after the first two dc2tog. In subsequent rows there is a ch1 after every dc2tog group - and there are 6 dc2tog in each group instead of 5. Can someone help me get going on this. I know I'll be fine once I get the pattern set up. I too am having issues as you did.. Can't seem to get started correctly. Did you ever get it figured out? I think there is an error in the pattern. I started it numerous times as well. I have been on sabbatical from my website due to RL issues. Upon returning and revisiting comments and patterns, I have found there is indeed an error in the wording of this pattern. In row one, it's supposed to be *(dc2tog)x6, not x5. I pay for this website out of my own pocket and share my patterns FREE, so I won't always have time to moderate and make changes. Shelly, I love ths afgan, I have a grandbaby due in April of next year. I will make this baby afgan for her. I can no waittill I get it finished, and I will post a picture of t f I can. Thank you for this pattern. I can't wait to try to make this.I am gonna be a grandma for the first time ( my very first granbaby) and I want to make this for him/her .